1. Made of superior quality Bao steel cold-rolled plates, and coated with 250℃ high temperature baking finish, our stationary screw air compressor is characterized by aesthetic appearance and good corrosion resistance. 2. Modular type steel panel design makes our stationary screw compressor easy to be dismounted for maintaining. 3. The reasonable design of inlet and outlet air passage ensures the good heat dissipation and noise reduction. The bilingual LCD intelligent control system can accurately display the working condition of the stationary screw air compressor. Even it can display the cause of fault when the compressor is out of order. The intelligent control system of our stationary screw air compressor is a leading time switch and remote control center. All electrical components are acquired from world renowned brands such as Schneider and ABB, etc. These give our air compressor reliable and fast performance. Made of high-density and environmental-friendly damping materials, the stationary screw air compressor is of international acceptable noise standard. 1. This air compressor is equipped with international-advanced taper sleeve type belt pulley which is easy to install and feature high centering performance. 2. The belt is acquired from Germany which features high strength, high efficiency and long life span. 1. This air compression machine is installed with a branded electric motor which is especially designed for screw compressors. The motor is manufactured with protection level rating at IP54, F class insulation and SKG high performance bearing. The motor features high efficiency and good heat dissipation. 2. The air compressor motor has reasonable structure and novel design. It adopts IC411 type cooling, IEC and 42673 standardized installation dimensions and power grades. 3. The full designed service factor offers protection for short-time overload. The intake valve is installed at the inlet of an air compressor and functions to control the compressor displacement. During operation condition, the control-signal controls the open and close of the intake valve to meet the air demand of compressors. When the stationery screw air compressor is shut down, the check valve in the intake valve will keep closed to avoid air backflow. The vertical-horizontal oil separator has integrated the advantages of both vertical oil separators and horizontal oil separators. The oil-air mixture will be separated by inbuilt high efficient separator, which can ensure the outlet air with oil content less than 3PPMM. 1. Through forced exhaust, the plate-fin cooling system ensures a consistent temperature for stationary screw air compressor to work properly even at a high room temperature. 2. With the enlarged cooler, the stationary screw air compressor can work properly even under an extreme high temperature and dusty environment. It also prolongs the cleaning interval of our screw air compressor, and it avoids the danger of lubricant getting coked in extremely high temperatures. 3. The small unit cooler and fan is relatively independent to each other, so it is much easier for screw compressor cleaning. Our stationary screw air compressor is equipped with oil filters from renowned manufacturers. These foil filters have large filtering area and high fineness, so they can effectively filter the impurities in oil and residuals resulting from machinery parts wearing. Thus, lubricants circularly injected in to the rotor and bearing will be filtered and cleaned, which ensures a longer air compressor service time. 1. The long life span of the main machine is ensured by advanced 5:6 dissymmetric rotors, imported oil seals, and SKF bearings. 2. Meanwhile, the main machine quality is further guaranteed by the three-coordinate tooth check and advanced assembly technology. We are a professional, China-based manufacturer and supplier of stationary screw air compressors. Since the company was established, we have been constantly making improvements on our production equipment and technologies. Thus we can keep leading in air compression equipment industry. To satisfy varied needs of the markets, we also produce medium pressure air compressors, high pressure air compressors, piston air compressors and centrifugal air compressors, etc. These products are widely applied in industries like mining, steel, coal, ship building, war industries, chemical industries, diving, spinning, and medicine, etc. We welcome our customers all over the world to inquire and purchase our screw compressors. 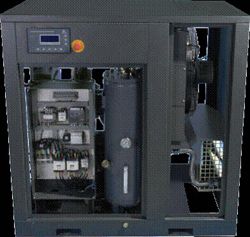 VSD Screw Air CompressorThe VSD screw air compressor is a kind of air cooled compressor. It features as follows.